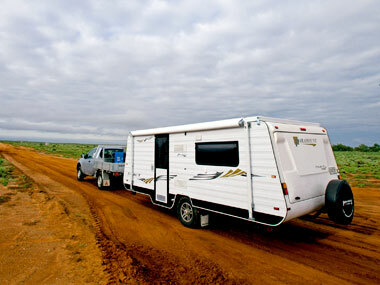 IF LIFE WASN'T meant to be easy, why’d they invent caravanning? A question for the ages, I suppose. 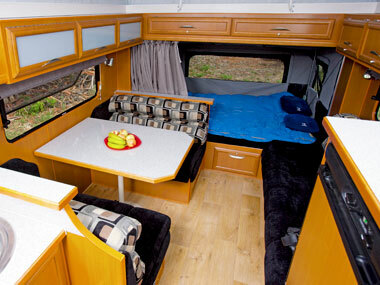 But the Paramount Duet, especially its highly liveable layout, offers a few hints. 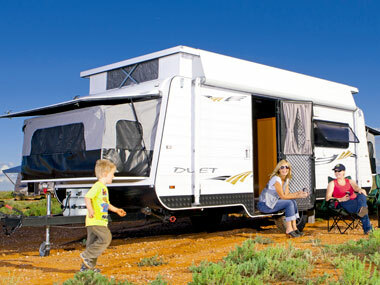 The Duet range comes in plenty of variants, from caravan to pop-top, with one or two fold-out beds, with or without a bathroom. Essentially, the fold-out bed(s) mean there is no need to compromise on interior space – whatever your touring needs, there’s a Duet for you. This flexibility cannot be understated. 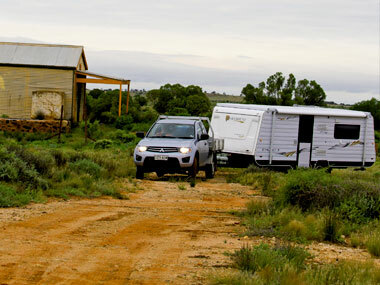 A couple of issues ago, we reviewed a Duet caravan with a single fold-out, which meant a full-width rear bathroom and everything in between, all in an ultra-compact package. It was a well-balanced van, in terms of both features and how it towed. So when we picked up our Duet pop-top, with dual fold-out ends, for our comparison test in Broken Hill, we had high expectations. Since taking a Paramount Classic along the Great Ocean Road some years ago, I’ve had a soft spot for the brand. And our 18ft Duet was every bit as nimble and capable as that long ago Classic. The judges agreed that this van had the best layout on test and more than a little X-factor. In fact, if entertaining was your thing, this Duet would be the van for you. And if it was just the two of you, perhaps with the kids or grandkids taking up the other end of the van, it would still serve you well. 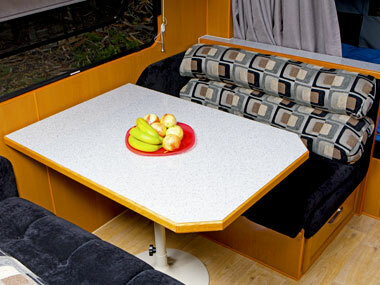 The nearside lounge and club-style dinette opposite, in particular, is a welcoming place. There is drawer access to the storage areas beneath each seat, and three lockers above both dinette and lounge. The kitchen ­­­was very well appointed, too. In fact, it was the only one out of the four to have an oven. Often, the inclusion of an oven means compromising on kitchen cupboard space; however, the Duet manages a very versatile kitchen with plenty of general storage, and all the mod cons, including a four-burner Thetford Caprice MkIII cooktop with grill. Stoppers on the drawers would’ve been welcome, though. The fridge is a decent 128L three-way Thetford with a locking mechanism that had judge Lionel Mussell positively grinning, with some bench space above. Part of the space beneath the sink is occupied by the plumbing, etc. – we would’ve liked for the hole in the floor through which the water tank filler hose, gas line to the cooktop, and PVC grey water plumbing run to be gapped with silicon – as it was, a bit of daylight and road dust came through. The sink (with Sanyo microwave set into the timberwork above) seems sensibly positioned, and for more work space the stove is recessed about 50mm into the bench, with a flush-fitting, bi-fold lid. The recessed cooktop/lift-up bench is an age-old solution to the bench space dilemma, but I confess to never having seen a lid which first hinges in half before lifting out of the way, as it does in this Duet. The lid folds this way because of the height restriction imposed by the Swift stainless steel rangehood, and it seems an elegant way of increasing veggie-chopping space. Above the forward end of the bench is the Aircommand air-conditioner, which does a commendable job of cooling things down. At the other end, next to the microwave, is a Kenwood sound system with iPod input, connected to four DNA speakers in the roof. The inclusion of a Winegard antenna is a plus. 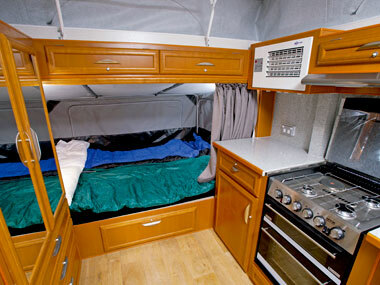 Up front, between the entry and the forward bed, is a double wardrobe – very spacious – with three drawers underneath. Adjoining the wardrobe is the kitchen pantry. Setting up the beds is a bit fiddly, but not too complicated. At the front, just release the catches either side of the moulded fibreglass lid, which rises to become a hard roof above the walls (the lower third of which is vinyl stitched to the upper canvas). The roof lifts easily on gas struts. A substantial sliding bolt retains the bed base in its vertical position – slide it across and the base lowers, pulling the canvas walls out with it. The rear bed, however, requires lowering the spare wheel. Just remove the substantial retaining bolt and the vertical member to which the spare is attached drops. Then release the clasps and the roof raises like the front one does. The base lowers in the same way. Now it’s time to ‘stretch’ the walls into position. The mattress has to be slightly manoeuvred out of place in order to raise a steel-tube frame that ordinarily rests against the ply base. That frame becomes the principal support for the walls. Two horizontal tensioning bars per bed then need to be secured. This requires sitting on the mattress to get everything into position, but, start to finish, the process shouldn’t take more than three minutes per bed once you’ve done it a few times. Each bed measures 1.9x1.3m. Externally, the Duet has all the basics covered: full-length awning; funky LED light; illuminated grab handle; and LED tail and running lights. And with 160mm of black checkerplate along each side, that classic Paramount shape and attractive decals, 15in alloys and black-painted chassis, it looks fantastic on the road. The front boot is a large space with plenty of room for camp chairs, hoses, leads, etc. 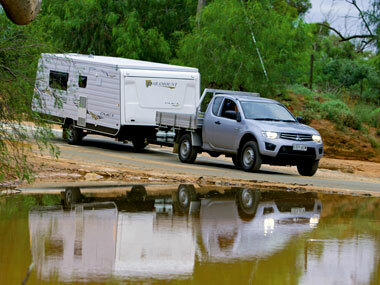 But because you can’t access the boot once the forward bed has been lowered, you will need to think ahead. (At one point judge Lionel went over to another van in search of a winder to lower the Duet’s corner steadies, rather than pack the bed away.) It’s by no means a deal-breaker, but for the forgetful vanners among us access doors either side would be ideal. Paramount is quite upfront about the boot not being weatherproof. It stands to reason: the walls of the bed are likely to gather condensation and rain, and once everything is packed away, the water has to go somewhere. Never fear, though: drain holes have been fitted both ends. Two 4.5kg gas cylinders sit on the 4in A-frame, which runs back to the leaf-spring suspension. On top of the A-frame, running the full length of the van, are 4in main chassis members, to which the 12mm ply floor is glued and screwed. The rear bumper is U-bolted to the chassis. The U-bolts appear securely welded. The water tank is mounted forward of the suspension and nicely protected by a gal stoneguard. Tow this van to the coast, set yourself up and get comfy. If that’s the plan, you’ve found a good caravan. 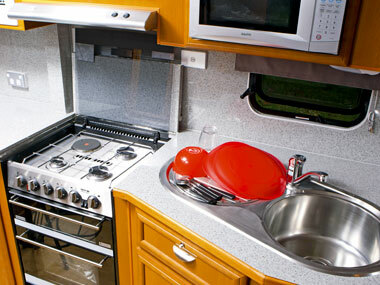 Its stellar layout and creature comforts (especially that oven) lend this rig to extended park stays. All things considered, we suspect that’s the kind of touring Paramount had in mind when designing this Duet.